as glycosyl donors. 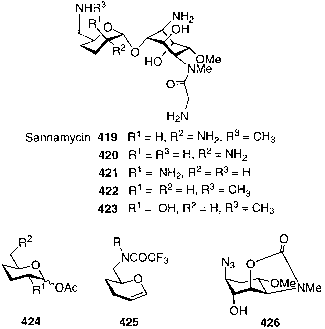 However these compounds were devoid of antibacterial activity, indicating that the presence of an ether linkage at the 4'-position (in comparison with apramycin, 48) is probably essential for antibacterial activity in this class of aminoglycoside antibiotics . Trehalosamine (433), an a,a-(1^1)-linked disaccharide produced by Streptomyces lavendulae, is an aminoglycoside antibiotic composed of d-glucose and 2-amino-2-deoxy-d-glucose . Ogawa and colleagues [253,254] used a racemic inosamine derivative to prepare the trehalosamine analogs 434-436 by glycosylation with an appropriately protected glucopyranosyl bromide. Likewise, a number of pseudosugar analogs, including the a-d-glucosides 437 and 438, were synthesized by glycosylation of the ¡-d-glucopyranose derivative 439 with the a-dl-glucopyranose 440 in the presence of trimethylsilyl trifluoromethanesulfonate (compounds 433-440 ). However, these compounds exhibited no antibacterial activity [37,254]. 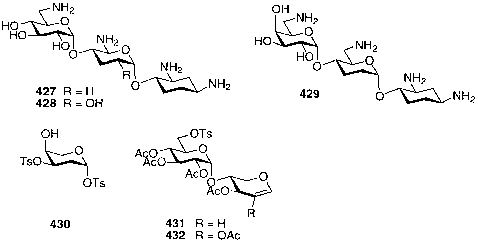 Acarviosin 441, an a-glycosidase inhibitor, is a maltose-type pseudodisaccharide that can be prepared from methanolysis of acarbose 442 . It has been shown to have five times more inhibitory activity than its precursor acarbose, for which the first total synthesis has been described by Ogawa's group in 1989 . The methylacarviosin 447, a core structure of acarbose and related pseudo-oligosaccharidic a-amylase inhibitors, together with its 6-hydroxy analog 448, were prepared by Shibata et al. from the corresponding oligobiosaminide derivatives 443 and 444. The aziridine intermediates 445 and 446 were treated with hydrochloric acid to give the corresponding 6'-chloro derivative, and then elimination of the chlorine by base furnished the title compounds 447 and 448 as peracetylated derivatives (compounds 441 -448 ).